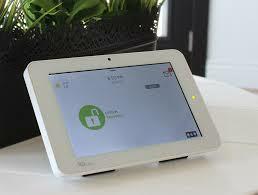 Cornerstone protection is pleased to announce our newest alarm panel called Qolsys, IQ2. This state of the art security panel offers more security features than any other alarm panel we have offered in the past. We will be releasing this amazing panel later this summer with power G technology from DSC. What is Power G technology? Power G technology is a wireless technology developed from DSC. These are the latest cutting-edge security sensors that offer some of the longest wireless ranges on the market today. They work at a significantly higher frequency than other wireless sensors, meaning their interference will be kept down to a minimum. The scope of the sensors is completely amazing, because some sensors can work wirelessly up to a mile away. The Power G sensors also utilizes 128-bit AES encryption to keep hackers out and secure transmissions to your alarm panel. Qolsys, who manufactures the new IQ2 alarm panel, reported at the ISC West 2018 alarm show that they will also be putting receivers in for Interlogic, GE sensors , Honeywell, 2 gig sensors , and also the new DLS Power G and Power Series receiver. What does this mean? This means if you own a Honeywell, 2 gig,or GE alarm system then Cornerstone Protection will be able to utilize what devices you already have in your home or business and give your alarm panel a new upgrade with the newest panel on the market today, the IQ2. We see this panel changing the way you see alarm panels. We just recently installed the IQ2 panel in a home in Richmond, Kentucky. We tested the wireless motion detector, glass break detector, and door/window contacts. The range on these sensors was unbelievable. This alarm panel also has built in Zwave transmitter which will allow you to also control door locks, lights, thermostats and much more making home automation easier than ever. Stay tuned for our official launch date of the new IQ2 security panel.